Dynamic Divine Energy is the Blueprint for all that Matters (pun intended)! 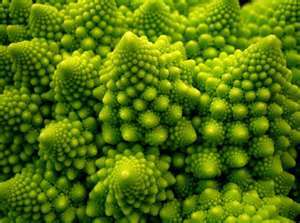 We are FRACTALLY connected to the entire universe by an energetically polarized atom-like, FRACTAL pattern that occurs across all of creation (“fractal” meaning, same pattern, different scales). Dr. Metz calls this his “Fundamental Field Theory.” In his theory, the human body is made up of the Fundamental Field pattern of Life-Energy. Dr. Metz can show you how, but it takes a book and a seminar from him to do so sufficiently. The FF Atomic Pattern of Life-Energy has 3 Magnetic Poles: Positive, Neutral and Negative (these names are not value judgements – energy just “is” – they refer to the energetic charge): The Positive Pole is located at the head, spine, sacrum and coccyx; the Neutral Pole is the Acupuncture/Jin Shin meridian system on the head, limbs and torso; the Negative Pole is the Chakra system formed by the energy pathways criss-crossing along the spine, often referred to as the caduceus, as demonstrated by the “staff” emblem. 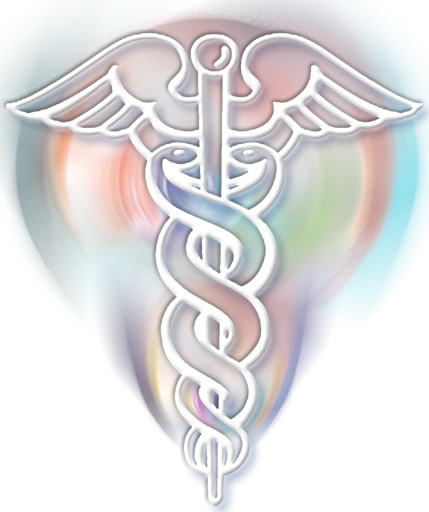 (Actually the proper use of the caduceus symbol is a subject of debate, a form of it is still used by the American Medical Association and other conventional medical groups. Regardless, energy pathways do criss-cross along the spine in that fashion, so I imagine that had something to do with the origin and widespread use of the symbol). In short, the FF consists of: 3 Poles, 5 Gross Aspects (as States of Matter), 10 Elements, 18 Spinning Chakras, 26 Sub-Chakras, 3 Dimensions of Space, 1 of Time, and 5 Subtle Vibratory Levels. The 5 Vibratory Levels are: Psychology, Motion, Physiological Motivation, Biochemistry and Structure. These resonate with and organize the 5 Gross Aspects within the body: Space; Gases; Chemical Transformations (which create heat, energy and change); Fluids and Solids. 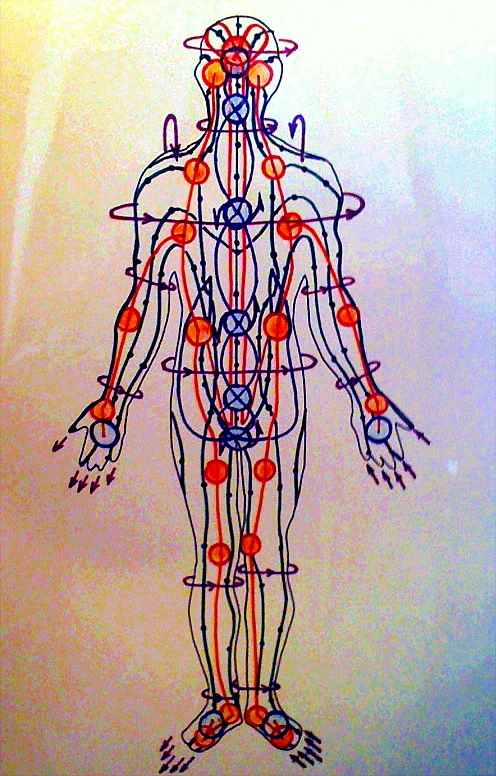 This is a hand-drawn, simplified rendering by Dr. Metz of the Fundamental Field Pattern of Life-Energy, denoting the major Energy Centers & direction of Energy Flows: Red is the Central Nervous System of the Positive Pole; Orange is the system of Jin Shin Points in the Neutral Pole; Blue is the Caduceus/Ayurvedic/Yogic-Chakras in the Negative Pole, as well as the Acupuncture Elements on the hands & feet in the Neutral Pole; Green is the Acupuncture Meridians of the Neutral Pole; & Purple is the Polarity Energy Flows of the Negative Pole. The FF can be approached practically and therapeutically with Energy Awareness Dialogue (making Conscious AND Unconscious Mind-Body connections), and Energy-Balancing Touch (a hands-on bodywork protocol), that maximizes the flow of Life-Energy throughout the system, optimizing health. When a person comes in we assess their entire energy system, on every level, to determine how these energies are interacting and how to best intervene for the highest good of the patient – the complete, and therefore ultimate, Mind-Body Energy Medicine. A session incorporates the modalities of Cranio-Sacral Therapy, Jin Shin Jyutsu and Acupuncture Meridian Systems, as well as Ayurveda and Polarity Therapy, all in one treatment. FF Therapy depends not only on knowledge of the energetic system, but also on the use of Intuition and Energy Resonance Scanning. The latter is actually the best and most efficient way to approach a bodywork session, as each unique system, at any one time, has too many complex interactional variables for an overly structured, linear “one-size-fits-all” treatment method. We all know how mechanistic Conventional Western Medicine likes its specialists, there’s a doctor for every body part it seems. Energy Medicine, in its own way, has its specialists too: Cranio-Sacral Therapy, Traditional Chinese Medicine and Jin Shin, Indian Ayurveda and Polarity Therapy, to name a few. FF Therapy is truly a generalist, holistic Energy Medicine, as it includes ALL of these disciplines into one theoretic model and therapeutic modality. It isn’t a specialty medicine for one area of treatment, it sees the bigger picture of how all of these specialties fit together and interact as a part of one Energetic whole. Each part, each modality, is valuable on its own, and effects the whole. But, isn’t it better to at least start out with looking at the whole first and then deciding how, what, when, and where and your focus should lie, and why? All, one or none? The Fundamental Field approach is more efficient, let’s just say that. And that’s it in a nutshell!